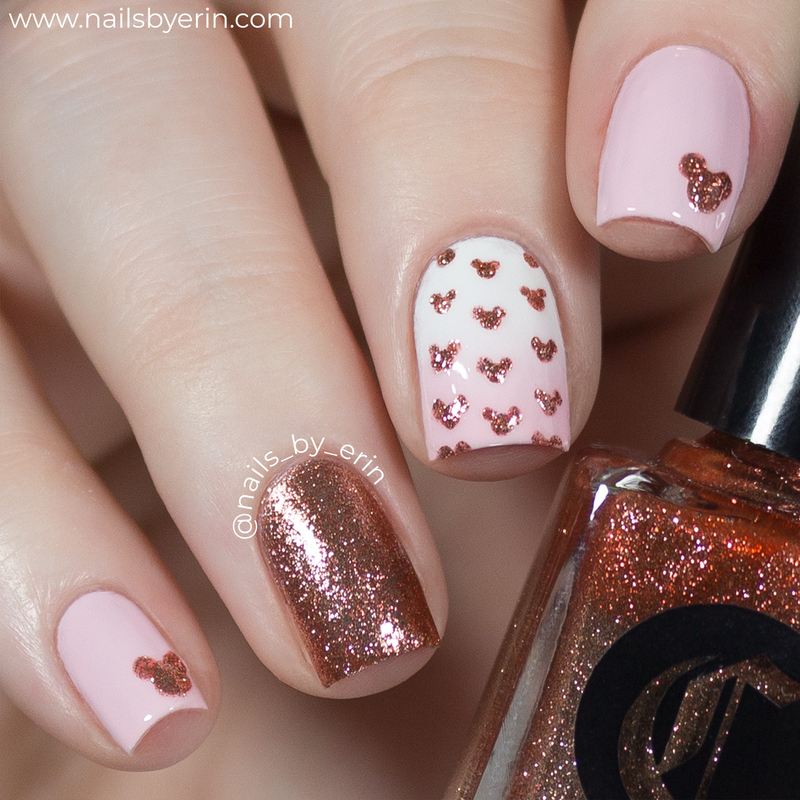 NailsByErin: Rose Gold Minnie Mouse Nails | Disney Nail Art! 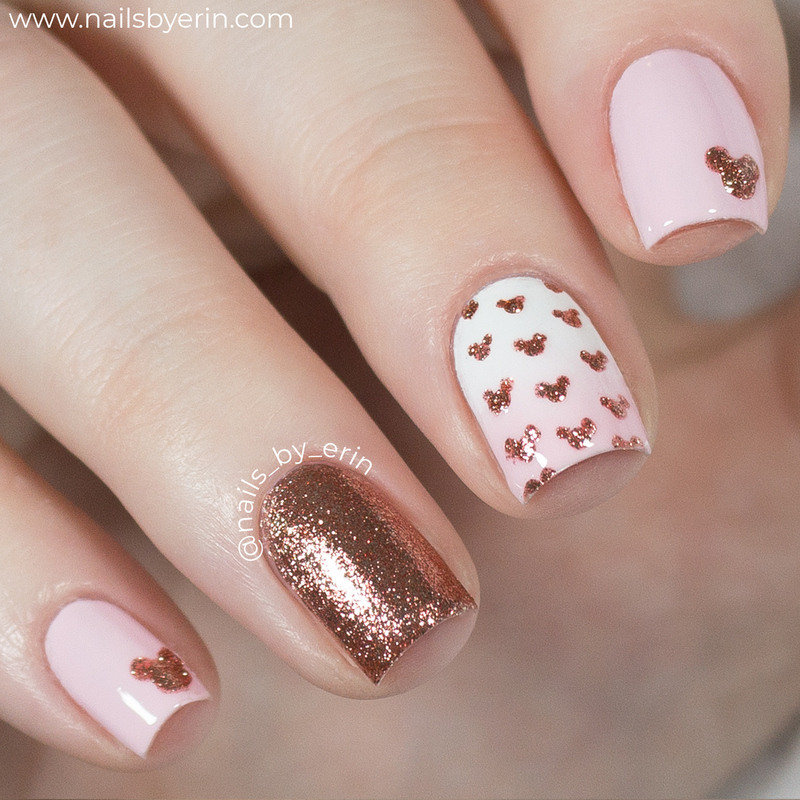 Rose Gold Minnie Mouse Nails | Disney Nail Art! I am currently in Disney World on a last minute trip before my spring semester of college begins! If you've been following me for a while, you know that I love Disney World and I absolutely love to do Disney nail art. Every time I go, I do some Disney nail art and take a picture in front of the castle! The last 2 times I've gone, I did the same Mickey themed nail art, which I love, but I thought it was time for a change... I've really been loving my rose gold Minnie ears (thanks Bri for picking them up for me since they were sold out when I went last year! 💕) and I wanted to do some nail art to match them. Though it may be a bit "basic" now, even I have to admit that I've jumped on the rose gold bandwagon. One of my favorite rose gold polishes at the moment is Cirque Colors "Halcyon". It ended up matching the Minnie ears pretty well! But I didn't want to just do rose gold and white, so I used this super pretty baby pink shade from the Orly Breathable line in "Pamper Me". I love these polishes together! And now, the obligatory photo of my nails in front of the castle! I do this with all of my trips to Disney.... The lighting wasn't exactly how I wanted it for this picture but you get the idea. I created a white-to-pink gradient on my middle nail as an added accent, and you guys know how much I love subtle pastel gradients like this. Then I created rows of tiny Mickey heads all on top of the gradient to tie everything together. On my ring finger and thumb, I did a rose gold glitter accent nail, and I added a rose gold Mickey head to all of my other nails. This is definitely a very girly design, which isn't for everyone, but I think it's a lot of fun and I love how they look with my Minnie ears. "Halycon" works well with the color of the sequins and "Pamper Me" matches the more pink tones in the Minnie bow. If you want to see how I created this nail design, then please check out my YouTube tutorial and make sure to subscribe while you're there!